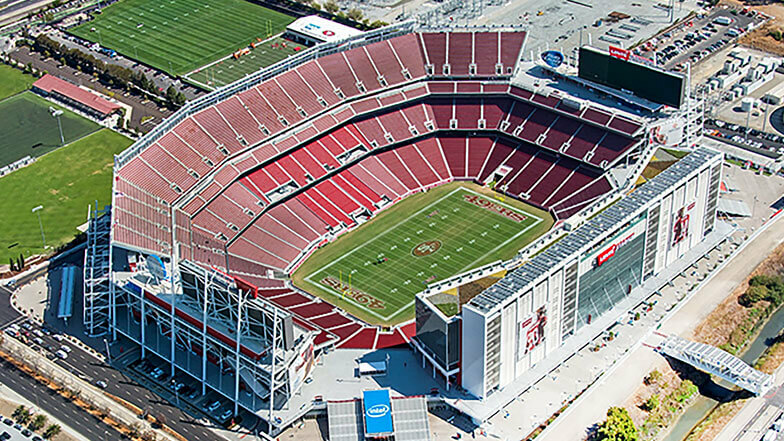 Levi’s Stadium is the first NFL venue to achieve LEED Gold certification, thanks in part to ACCO’s swift installation of tons of sheet metal, miles of condenser and hot-water piping, and 21 large-capacity Daikin Self-Contained AC units on a fast-track schedule. Stadium construction began in April 2012 and was scheduled to finish in time for the first preseason 49ers game in August 2014. The South Bay microclimate and energy performance were chief considerations for mechanical, electrical, and plumbing (MEP) systems. Thermal comfort of the football players and visitors’ comfort were also considerations. A condenser, tower water system for heat rejection of the packaged AC units, and a highly efficient heat pump for the domestic hot water system were determined to be the best HVAC solution for the stadium. Mechanical equipment also had to meet the energy performance requirements for LEED Gold certification and the California Energy Commission’s Title 24 Building Energy Efficiency Standards. The entire HVAC system was specified as variable flow with enhanced controls to optimize the performance and improve energy savings. The ventilation system was specified as centralized VAV with airside economizer. As part of the energy modeling, the equipment and system evaluation was critical because of the unique peak demand of event days, such as football games and concerts. Daikin water-cooled Self-Contained AC units were the clear choice given the equipment specifications and “required on job” dates. While commercial grade AC equipment was the engineering baseline, the flexibility of using an original equipment manufacturer was important so that contractors could incorporate preheat coils, air flow measuring stations, and control interfaces such as smoke control. The efficiency of the Daikin Self-Contained AC units and the refrigerant specifications exceeded the minimum requirements for Title 24 standards. 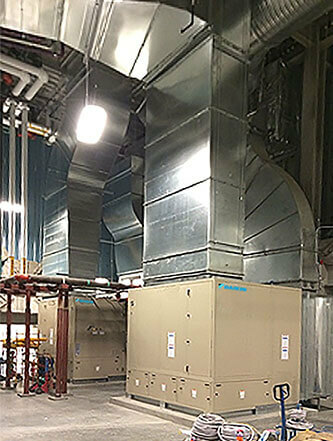 Daikin worked closely with ACCO by providing 3D CAD files of the 100-ton water-cooled Self-Contained AC units to assist with the modeling of the equipment rooms, ductwork, and piping systems, which made for a smooth installation process. Equipment room space was at a premium both in the belly of the stadium and in the upper luxury suites and office areas. The compact design of the 21 large-capacity Self-Contained AC units, sized up to 100 tons each, enabled the designers to save space in the equipment rooms by having fewer units. The units were semi-customized to include preheat coils for winter conditions. Normally, the hot water coils would be ordered separately. For this project, the Daikin engineers were able to insert the hot water coil into the standard cabinet, which also saved space. In addition, some of the stadium mechanical rooms are located near occupied spaces; the plenum fans on the Daikin Self-Contained AC units generate less noise than similar models of other manufacturers, so they met the stadium’s low noise requirement. independent projects running concurrently: suite tower section, bowl side (main and upper concourses), and event level (lower bowl). The construction sequence was incorporated as part of the engineering efforts to avoid start-up issues, given the common ductwork and piping systems between the suite tower, bowl side, and event level. ACCO installed the sheet metal, piping, and HVAC systems, maintaining cleanliness in compliance with indoor air quality standards for LEED certification. Daikin worked closely with ACCO by providing 3D CAD files of the 100-ton water-cooled Self-Contained AC units to assist with the modeling of the equipment rooms, ductwork, and piping systems. The modeling and design efforts made for a smooth installation process. Building the stadium required complex sequencing among various trades. ACCO alone employed 125 engineers and field personnel to design and install the sheet metal and condenser and hot-water piping. Deliveries of materials and equipment, including preassembled ducts and piping components, were made on a just-in-time basis, with multiple daily transfers made to the jobsite from a nearby receiving yard. As part of the ventilation system start-up, local and factory Daikin technicians were on site to verify the packaged AC unit controls. Work included preparing the interfaces to the stadium’s building automation systems (BAS), firmware updates, and operational settings among numerous HVAC applications. 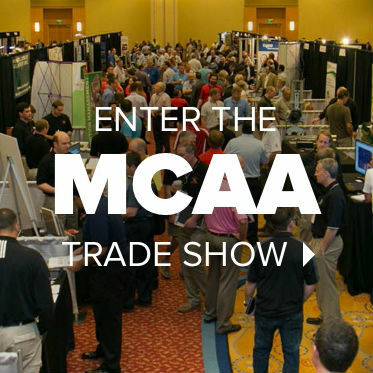 Start-up and commissioning efforts began in summer 2013 to ensure the entire construction and operations teams were synced for a successful delivery of MEP, various BAS, and food service systems. Systems were operational in time for the stadium’s soft-opening event in April 2014 to include commissary and other early move-in spaces. After a record-setting and fast-tracked building process, Levi’s Stadium hosted the first 49ers preseason game and received LEED Gold Certification for Building Design and Construction of a new facility. Visitors can view a live dashboard display, located inside the stadium near the 49ers Museum, featuring current energy measurements, water and air monitors, and other dynamic green features. After the inaugural season in 2014, the HVAC systems were reevaluated, and performance was compared with the energy modeling. The Daikin Self-Contained units performed as specified. On February 7, 2016, Levi’s Stadium was the proud host of Super Bowl 50 and accommodated nearly 72,000 visitors.